Charles Fox Homes recently came to ICND for improvements on their website. After consulting with the client our designers at ICND did a total redesign of their site. Our programmers built and incorporated a custom content management system into the site for site administration. In addition, a custom designed photo gallery was added to the site. Charles Fox Homes will update a new home’s progress weekly with information and pictures which can easily be accessed on his website. 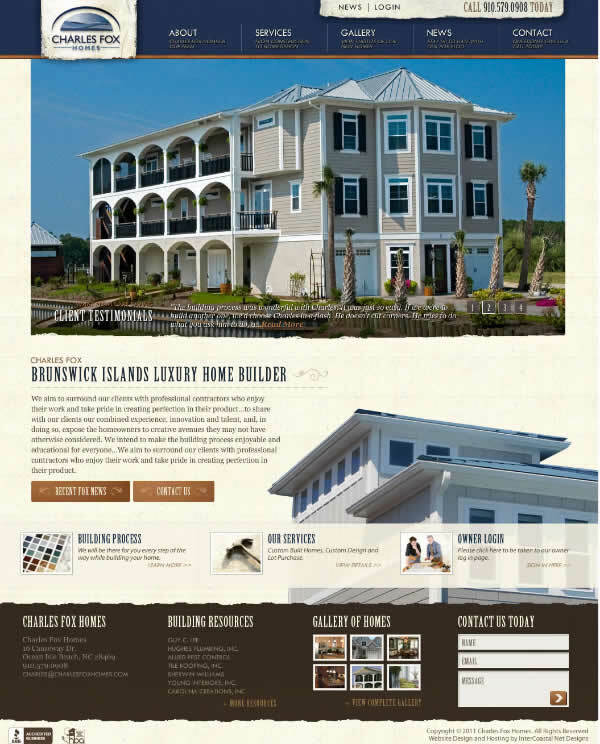 A local Brunswick County builder, Charles Fox Homes is located in Ocean Isle Beach, NC and has been in business for 13+ years. Whether it is a Low Country craftsman home or an elegant and contemporary island cottage, Charles Fox Homes believes in tailoring every detail to the client’s vision. His designs and buildings are extremely versatile, with prices ranging from $200,000 to $1 million plus. A deep appreciation and love for the coast and the Carolinas is evident in the creative designs and construction of custom homes by Charles Fox. One of Charles’ strong suits is his ability to foster meaningful relationships with his clients that extend well beyond typical business dealings. Charles believes that having an open and honest relationship with each homeowner is critical to the success of his business. During the building process he encourages you to meet with their trusted local vendors for your home specifications. “The most vital ingredient to a successful building business is a happy and content homeowner,” says Charles Fox. In addition to building custom homes, Charles Fox Homes also offers custom remodeling — for those special clients who love their location but would like to unlock their current surroundings’ potential. By observing the unique relationship between the existing structure and the clients, Charles is able to design a fluid merging of past, present and future, resulting in harmonious final product. If you are looking to build, but have searched for your dream lot to no avail, Charles Fox Homes LTD, in cooperation with Coldwell Banker Sloane Realty, can assist and advise you with your selection.